The camera and computer do not give these two bookmarks the justice they deserve. Each was done in exactly the same red, white and blue. The beetle centers vary but that's it. The red on the blue border one appears orange on my computer screen but imagine American Flag red. I wasn't sure I liked the one with the red border much so I tried it with the blue border. They are both OK but I am not in love with them. It may be that I really don't care for these two primary colors. Using white in taquete is problematic. You can't see it from the photo but the white portion has a pink cast on the blue border bookmark. The white part on the red border bookmark has a slight blue tinge. You might expect the opposite; thinking that the border color will bleed into the white. The actual result has to do with the order in which I weave the colors. The order impacts which color stacks on top of each other. I am weaving four colors each pass and then packing them in with the beater. 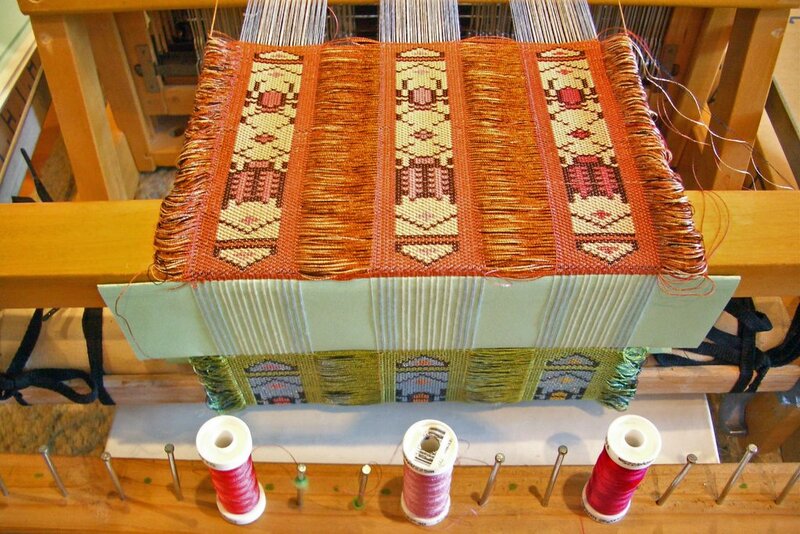 Each color finds its natural place based on the order it is woven. I could have achieved either result depending upon the order I wove the thread colors. If the beetle outline color [let's say it's red] follows the white - - it will stacked right under the white. The red then permeates the white to give it a cast of red - hence showing up a slight pink. The blue went first so it's at the bottom and has no impact visually on the white section. This is why one always must test the colors in taquete since what you think will come out usually doesn't. Something to remember when selecting colors for taquete particularly when using light or translucent colors. Yesterday was the first day I knitted in public. I was attending a tax seminar all day and brought my knitting along. I kept the ball of yarn in my pocket and knitted in my lap. A few people watched...I mean really - which is more interesting - a power point presentation on taxation for 501(c)3 organizations or me knitting. I have no poker face...so each time my yarn slipped or I counted wrong my face said it all. For my next knitting project, I decided to work on something small and repetitive. 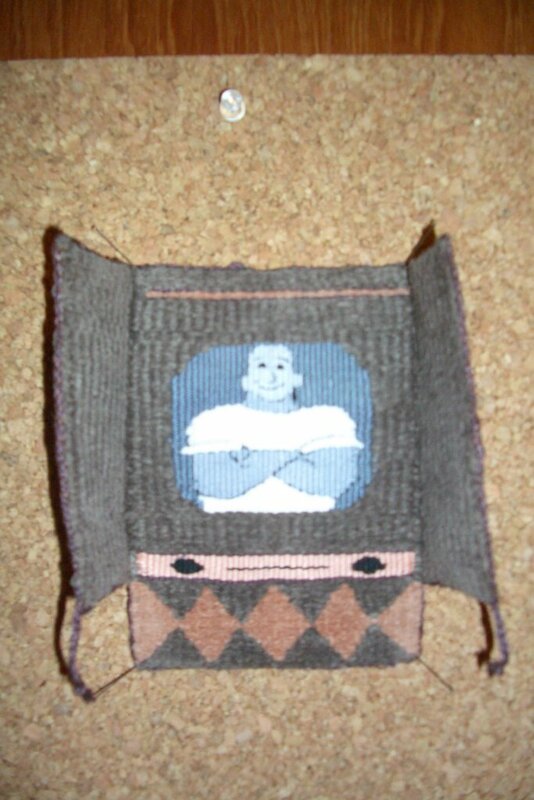 The next item in The Sweater Workshop book was a sweater. That was way too much for me. I turned to the very last item in the book - a beaded rib scarf as my choice. The book helpfully points out ways to have good corners and no flare outs at the scarf ends. Once up and running there are only two patterns to memorize. I can't say how many times I got all messed up with this seemingly simple pattern. Finally put three markers in so I would know quickly whether I had made an error or not. I have yet to master the undoing of stitches. It usually looks worse after I un-do and re-do than if I had not re-done at all. Hence, I need to catch any mistake as soon as possible. 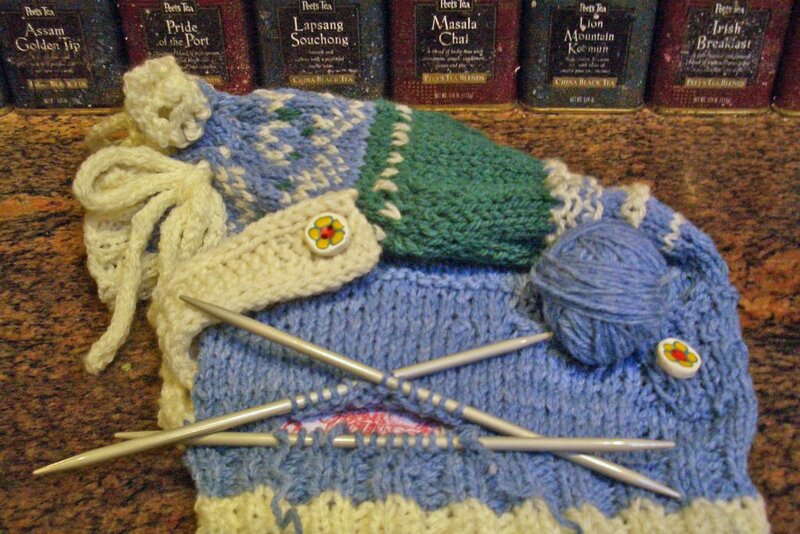 I also got to try out those cool interchangeable knitting needles. I sampled 5-8 and decided I liked the 6 the best; although many seemed pretty similar. 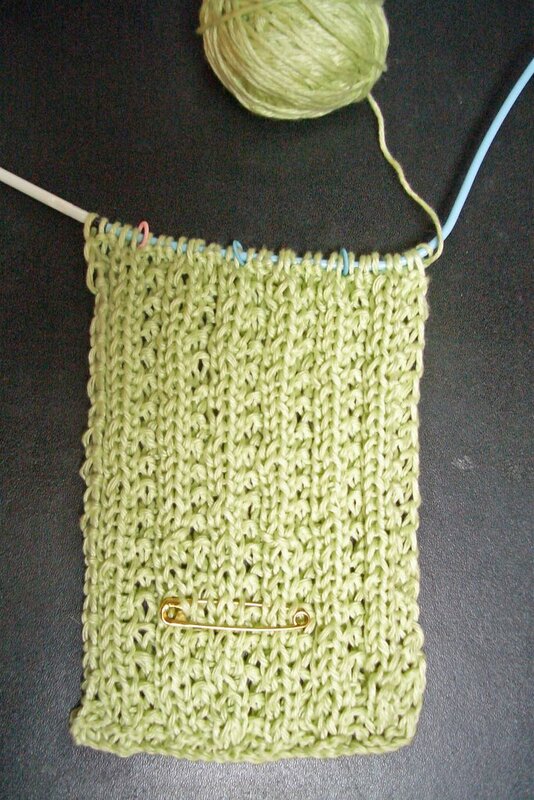 I am using a Cascade yarn called Pima Tencel in a lovely green. It is quite nice to feel; soft and smooth. Yes, I started up again yesterday. I finished the red, white and blue bookmark with some metallic thread as embellishment. Now I am working on a blue, white and red one with sliver metallic thread. I am interested in seeing how switching the colors alters the mood of the piece. In addition, I want to see how much longer the bookmark will be using sliver metallic vs. regular metallic thread. The sliver is more like a thin ribbon while the regular metallic seems thinner than rayon embroidery thread. I had a tough time weaving with the metallic thread since it kept unspooling. The sliver is heavier and it doesn't slip as much. I'll show a picture next time so everyone can come and contrast the two color permutations. Hard to believe I started out at the Opening Ceremonies barely able to hold my knitting needles but with the help of this book I am now able to do a reasonable knit and purl as well as a multitude of other knitting techniques that many knitters have never tried. I would encourage any beginning knitter to work through the sampler in The Sweater Workshop to gain some worthwhile insights on the ins and outs of knitting construction. And finally what to do with all those ends. 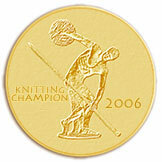 2. the Yarnharlot who created the concept of the Knitting Olympics. Without the tight timeframe and pressure of documenting progress in a public way, I doubt I would have ever finished this piece. Knitting Olympics - the end is in sight! 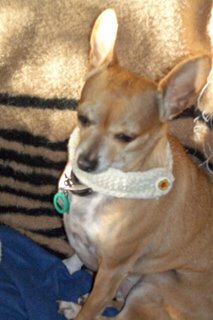 Here is Bunkie modeling the cute belt I just finished as part of my 'learn to knit sampler'. It is supposed to go through the sweatshirt pocket and go around the piece. I made it with a slightly heavier yarn than the rest of the sampler since it looked too messy in the original yarn. Note the button...one from a previous workshop . I think it is just perfect for a chihuahua collar. I have made great progress since I blogged last on my Sampler for the Knitting Olympics. I have learned to knit with two colors which was quite a feat. It seems similar to playing the piano where each hand has to do different things or rubbing your head and your stomach in different directions. It takes lots of patience and practice. I also learned to darn and added a touch of green in the blue and white Scandinavian pattern. The most fun was near the top where I learned how to made intentional holes in the piece. Nothing better to plan to make a hole and have a hole appear where you want it. What have I experienced over the past week? I'd have a plan with no hole yet a hole would appear - the unintended hole. Here the plan was to have holes uniformly spaced around the piece so a knitted cord could go through. It worked! 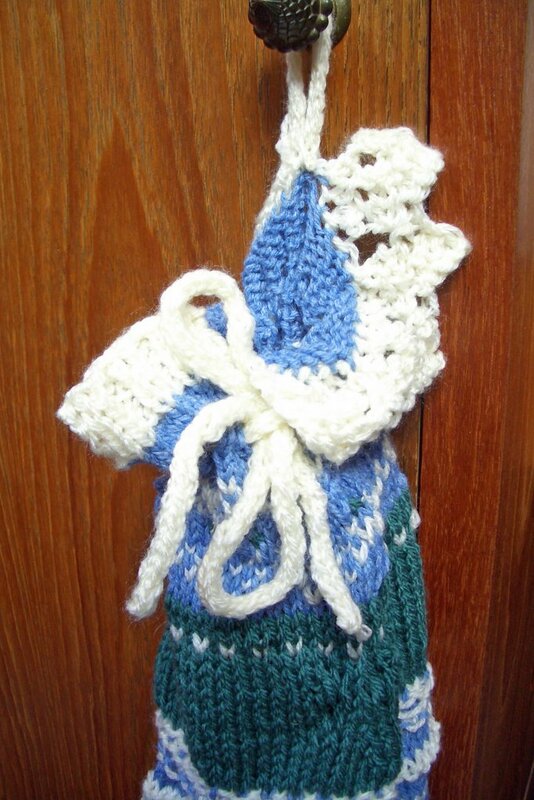 You can see the knitted white cord tied in a bow in the picture below. The sampler has four different types of cast offs on the last round. 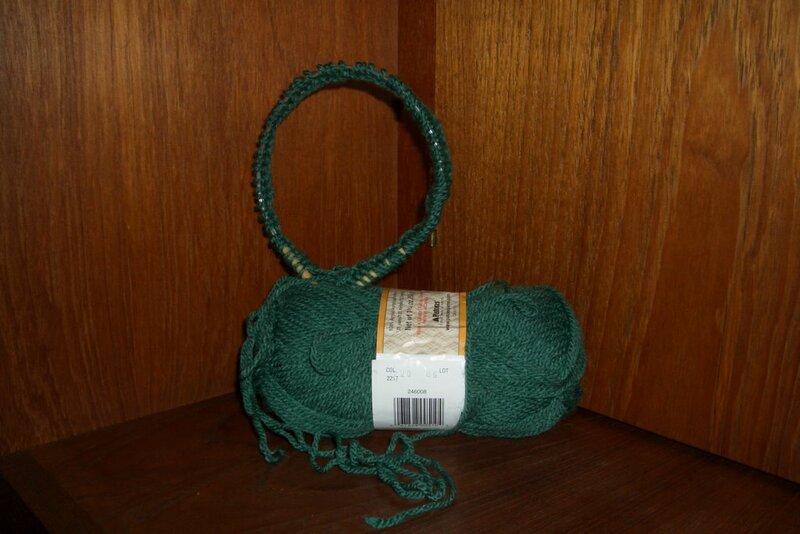 I learned how to do a knitted cord cast off along with a loop that you can see attached to the door knob. The loop is a good idea to remember for future pieces...then there is a greater chance the piece will be hung up vs. end up laying on the floor somewhere. The lace cast off is on the right at the top. I can imagine this as a little collar on a chihuahua coat. Please imagine that hole [I am sure you see it!] a bit smaller...it seems I lost a purl along the way and the hole turned out larger than it should have. There is also a section of cable cast off plus a hem with the initial 'B' knitted in. They don't show up well...you will need to trust me that they are there. Only two more Olympic events to go...1. adding a pocket after the knitting is off the needles and 2. finishing up all those ends that are inside. I hope to finish tomorrow. 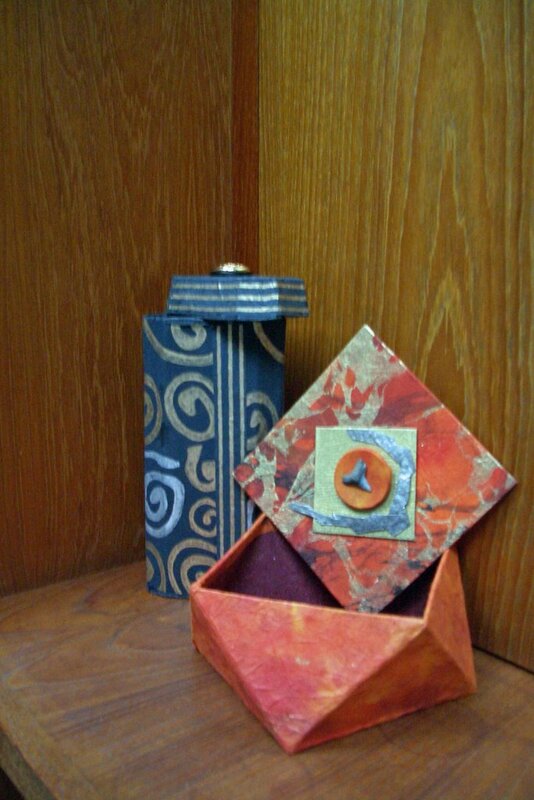 These are are the two boxes I made yesterday in a workshop given by Betz Salmont. It was quite an enjoyable day with a bunch of enjoyable people. I found it interesting how scoring would make the matt paper fold into shapes I thought I could not build myself and how the Japanese paper was so forgiving to cover mishaps along the way. I am pleased with the results and will be using one for an upcoming birthday party. Big mistake! 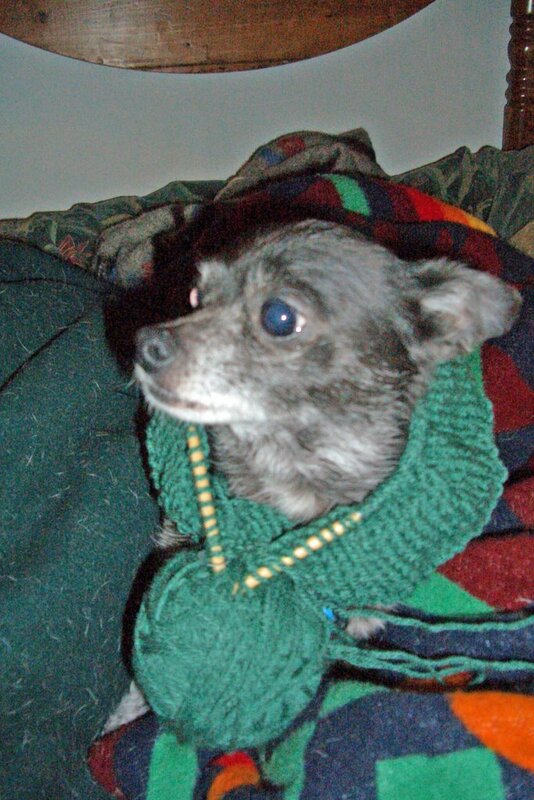 Do not try to have a dog model a knitting sampler without securing the ends of the circular needles. I was looking for an interesting way to display my progress on my 'learn to knit' sampler. It is shaped like a cyclinder and look way bigger than my dog. So I figured 'why not? '...so I put it on him...remember I only put in one placket so there was only one hole for a dog's foot...bad idea...long nails...squirmy dog...lots of loops came off the needles...ah well...live and learn. I looked around for a more cooperative model and found my wooden Australian platypus ....not exactly the same shape but it does provide a good view of my progress. So let's see...since starting the sampler I straightened out my knitting and purling; hopefully making the correct way a habit. I have learned the cable cast on, a garter stitch and the stockinette stitch. I have learned to fix a broken piece of yarn and change the color of yarns. I can knit three different types of ribbing and add a stripe. 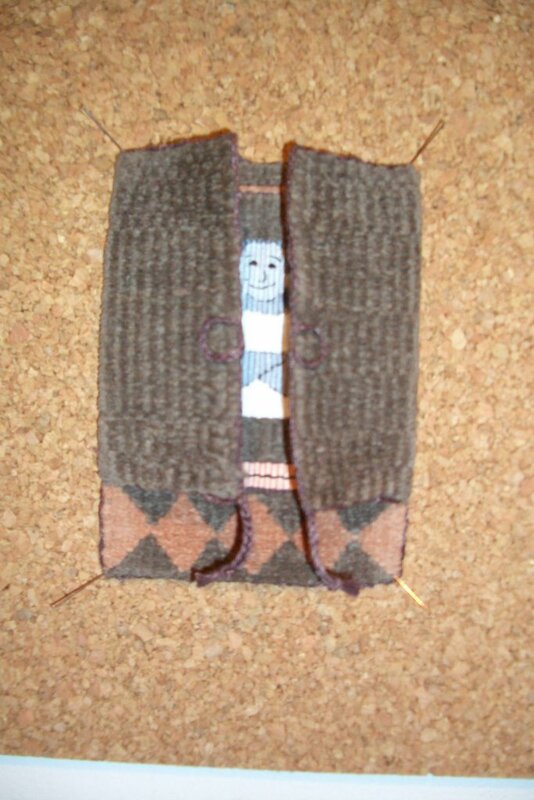 I can do a short row, a cardigan border on a mini placket with a button hole and a very cute sweatshirt pocket. The pocket shows well in white on blue in the photo. In the last couple of days I also learned to increase and four or more ways to decrease plus make three types of stripes; a knit stripe, a purl stripe and a raised stripe. Phew! That's a lot to learn for a new knitter; particular since the start of the Olympics! Two color knitting which looks like fun. 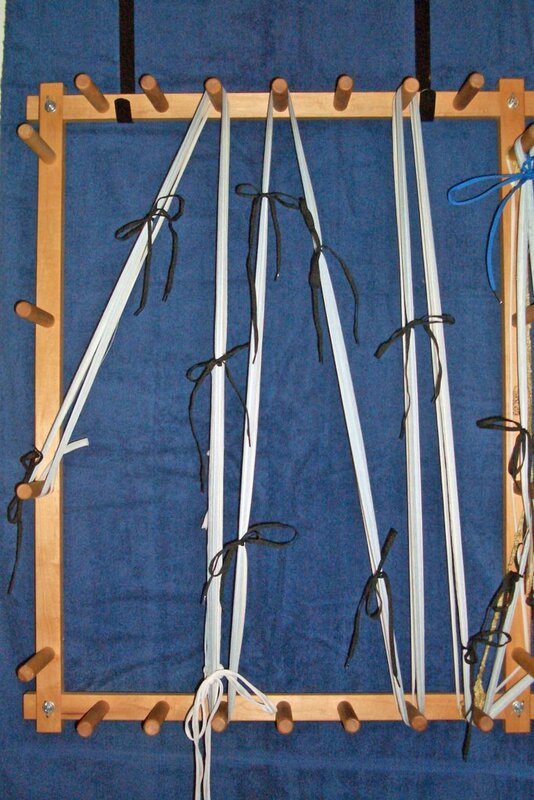 Grafting, lacing, hemming and what to do about all those ends. Although two color knitting looks like fun I could use a break. Fortunately I've got a workshop planned on making boxes. So I am off to box. Can you weave during the Knitting Olympics? My answer is yes! I made some progress this afternoon on my beetles. I was going for an Indian mudtone look. The photo makes it look a bit more orange than it really is. I am thinking of doing one in red-white & blue colors to celebrate the USA in the Olympics. Does anyone have any suggestions for future beetle colors? I should have enough warp to do at least a dozen more beetle color permutations. There should be four colors - one for the frame, one for the background, one to outline the beetle and one for the inside of the beetle. Just let me know in the comment section. If I have the colors in my thread collection and my experience says the colors may work well in taquete - then I'll try it out! All this weaving talk - does this mean I have been ignoring my Knitting? Of course not - two more Events finished [but clearly not mastered] this morning. Quite a difficult task this Cardigan Border on a mini placket with a button hole, slips, cast offs and more. 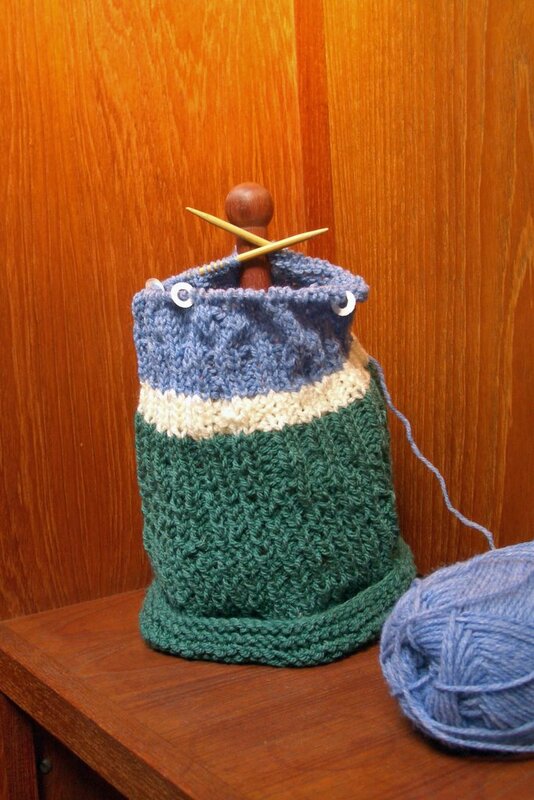 It took me awhile to figure out what and where the border was since I seemed to be knitting a cylinder. Actually there were two borders - hence many of my early errors. I had never heard the term placket so to knit one was quite a challenge. My first button hole was on the wrong border ...but then that button hole disappeared somehow...the second one was somewhat in the right area and I made sure it did not disappear. Then there was the 'knit flat' vs.' in the round' issue...since I have only knitted in the round on circular needles this added some more difficulties with when to knit or purl and whether to do it from the front or from the back. I would say, the stockinette section just competed has a great deal of 'visual interest', uniqueness ,texture and negative spaces...few would recognize it as stockinette! I just found out I was accepted into the Purling Puppies WebRing. How could I not join...I just love purling and I love puppies! And they have such a cute button! Good grief!!! Have you seen the clock on YarnHarlot's blog? There is a countdown to the end of the Olympics! Only 10 days and around 20 hours to go...and I have 16 Events to go! It certainly grew since the last picture from the end of Day Three ! This sampler in the round is now too big for my chihuahuas to model. I added some K1 P1 ribbing, followed by some twisted ribbing and then some K2 P2 ribbing. And finally, I learned how to change the color! Thank goodness, that green was getting quite boring. 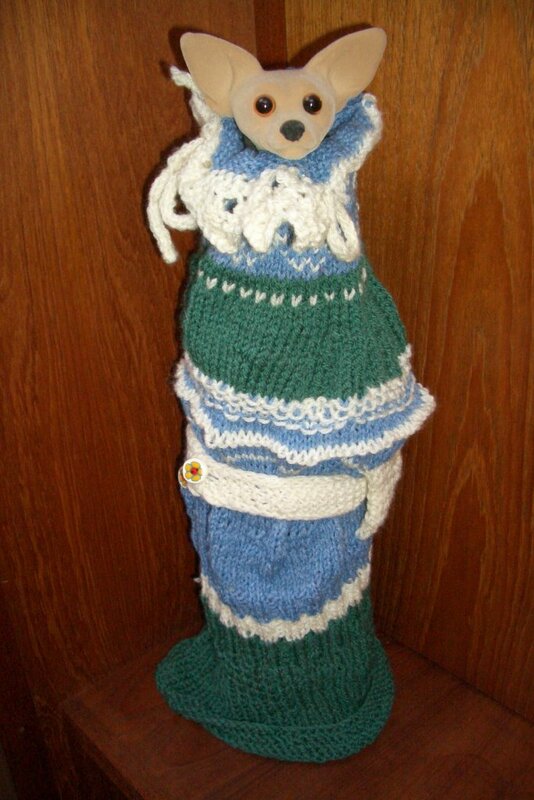 It's quite amazing...it looks like knitting. I must say, this is quite a learning experience, stitches kept mysteriously appearing and disappearing so I had to add some markers every 20 so I could more easily figure out if I had lost or adopted a stitch by mistake. I had several 'ahh' moments - one was when I read the instructions for the twisted ribbing and discovered I had been doing the knit stitch from the back the entire time. 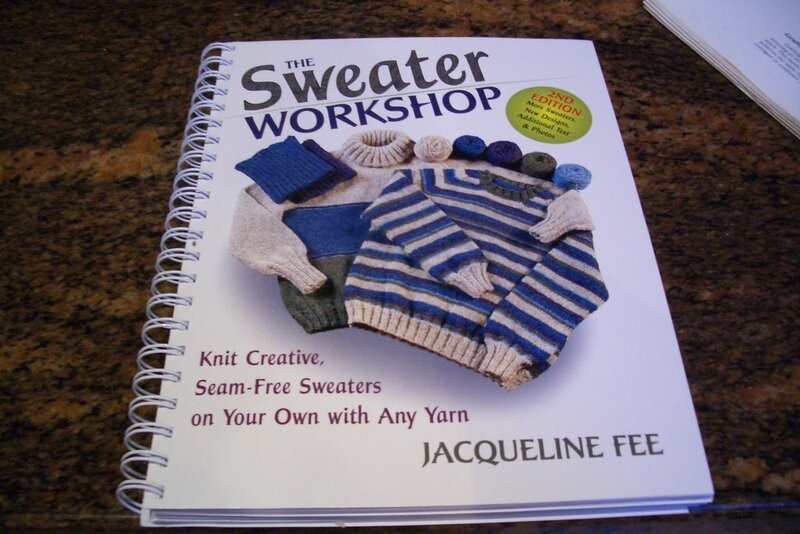 I do like Sweater Workshop book quite a bit so I ordered one for myself. Yes, Merna you will get your book back soon! It has lots of helpful hints on how to make something without a pattern but without winging it. I already have lots of ideas for the chihuahua sweaters. They should look quite brillant. The next few Events are quite technical. I read about Chain Selvedges and Cardigan Borders... will need to read them several more times before I move forward. After that there is the ever popular Button Hole and Sweatshirt Pocket Events. Here is where my Knitting Sampler stands at the end of Day 3. As you can see it has gained a couple of inches with the completion of the Stockinette and Making Connections Events. I now move into the Three Ribbings; K1P1, twisted rib and K2P2. This looks to be a long event. Time will tell. As I look back, I see I could have done a better job on the Garter Stitch Event...but that is history and I have another twenty two events to go. 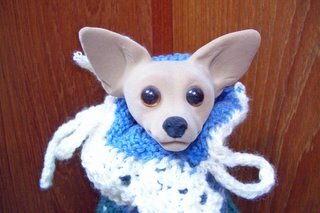 A Day One Perspective on the Knitting Olympics: I was checking out my favorite blogs yesterday and was somewhat floored by Almost Felted. 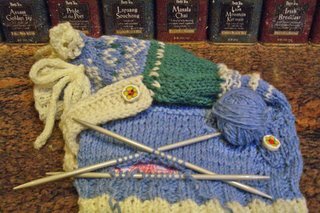 While I had successfully Cast-On my 80 stitches and gone once around my circular needles, she had completed two hats in the Knitting Olympics on Day One and had expectations for more. We are clearly on different roads to a gold medal. I did make more progress yesterday getting through the Garter Stitch Event and moving on to Stockinette. I was reassured when a fellow knitter told me I was doing my purl correctly. I think I can now get rid of that nagging feeling that my purl is somewhat backwards. No picture update...just look at the previous one [Day One] ...not much different than its current state after Day Two...just a bit more green showing. Once it gets that 'knitting' look, I will show a progress photo. I have also discovered I really must concentrate when knitting. No distractions. No TV. So this will be the knitting Olympics without actually watching the Olympics. Yesterday at our Guild meeting, I was knitting through a slide presentation and suddenly realized I had heard nothing the speaker had said! I put away the needles and watched the slides. Here is what I did at an afternoon workshop on Polymer Accessories for your Handwoven Garments taught by Norma Pavely and Laurie Shaffer... I'm not much of bead or jewelry person but it was a fun class and will be useful when I need that special button for something I have woven or knitted. It was fascinating to see how one can mix, roll, cut and shape clays to make different designs. Ever wonder what over three miles of warp look like? Well, here it is. 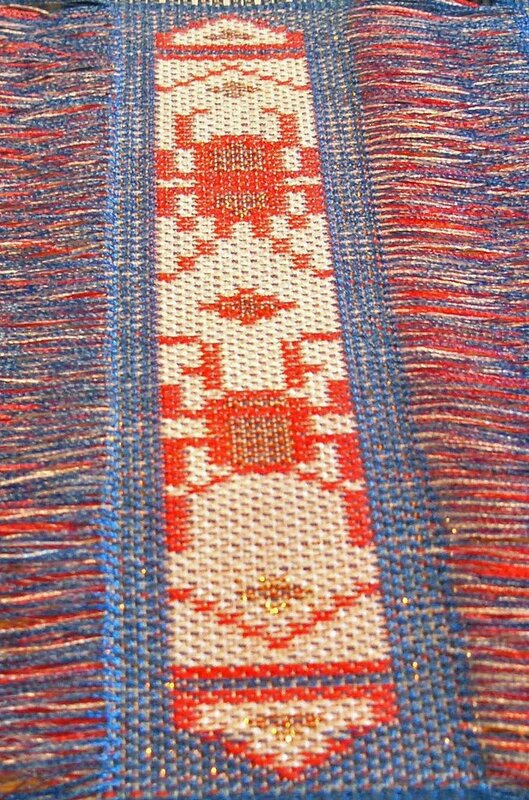 I just finished measuring off the warp for my next weaving; another try at some beetle yardage. I did the calculation and there is enough sewing thread on that warping board to cover a 5k running course. I used to run 5 and 10k's...this is really hard for me to believe! Well the Olympics started today and so I started on my knitting sampler. I had a number of false starts but finally with a change in yarn color I completed my Cable Cast On and the First Round. The cast on stitches were a bit tight but the first round was much looser. The two didn't connect real well but I guess future rounds will make it come together. After I did it over two or three times each time re-reading the directions and it came out looking the same...I figured well, that's the way it's gonna be! Take a look...not much to look at yet...but a sampler is a sampler and it must start somewhere. The picture of the sampler in the manual is pretty funky looking! 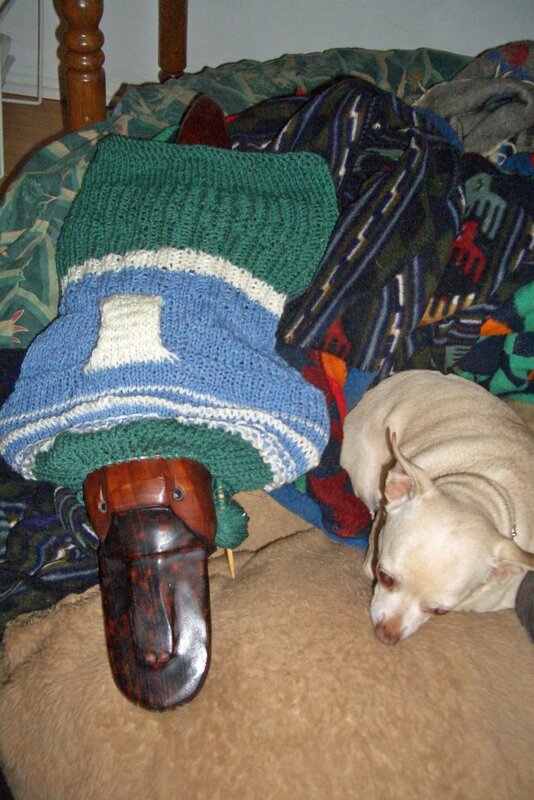 Looks a bit like a good sweater for a very lumpy dachshund. I must admit this is going to be much harder than I envisioned. But it is only the first day and only the first two 'events'. Weaving - I should be good at this! Once I complete this whole list of knitting techniques I should be able to knit anything! Pretty good for a non-knitter! The equipment has been assembled, checked and re-checked for the Knitting Olympics. There is the normal pre-competition jitters. My four coaches have provided their bits of advice. It may be tough to get a good night sleep. Ah, it is good to be back. Nothing as comforting as all your looms within reach and a working DSL line. Now, just because I was away does not mean I did not accomplish anything. 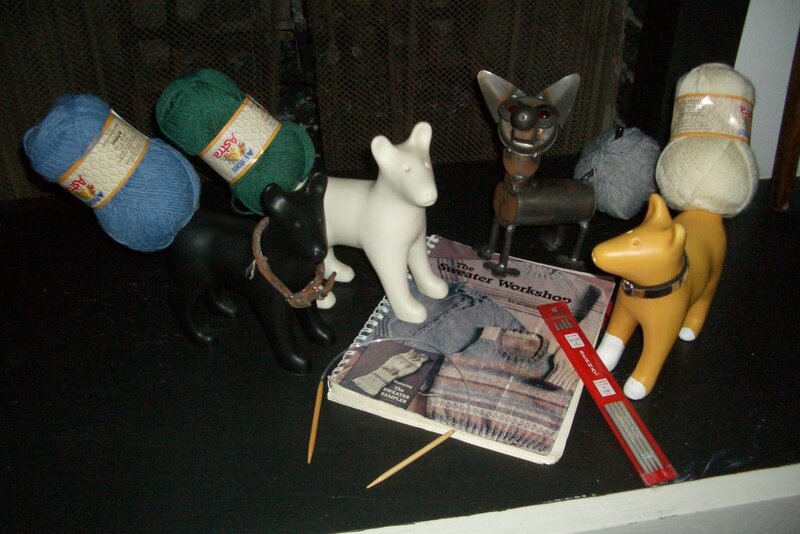 I spent several days in training for the Knitting Olympics. Hard to believe over 3000 knitters from around the world are participating! My training included learning the Cable Cast On, practicing knitting in a circle and discovering my purl was being knitted consistently backwards. So, I am now ready for the opening ceremonies. On the weaving front Mr. Clean #2 is complete and ready for GRAND IDEAS in Grand Rapids...well...except for the required labeling and the addition of a hanging strip. The concept of the Vintage Cabinet TV set came out quite nicely. The chenille makes a nice wood and the diamonds reminded my sister of an old TV set we had. 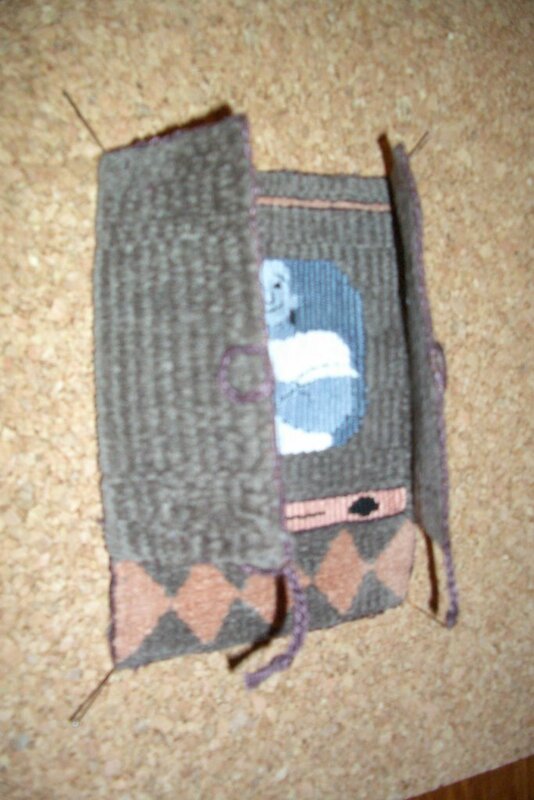 I included two small tassels on the weaving in case viewers wish to ignore the admonishment 'do not touch' and open the TV cabinet a bit more for a better view of the TV screen. You can see that Mr. Clean #2 seems a happier fellow with a much whiter shirt than the previous Mr. Clean - clearly a better advertisement for the product! The dyed warp was twined and braided to form a 'wooden' decorative border on the TV cabinet. 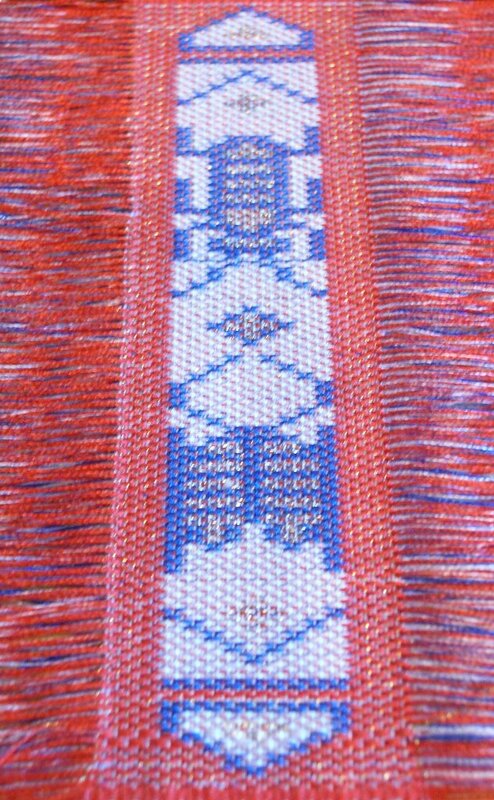 The dyed warp also created a bit of an issue since it started breaking around the last couple of inches of weaving. That's what I should expect after dyeing the warp three times!